Afternoon tea in Aberdeen, in special places like Patisserie Valerie is a great way to relax and refresh after a busy morning in the Granite City. It usually takes place after 2pm and before 5pm. It has its origins in England where traditionally it was and still is a small snack typically consisting of light sandwiches, cakes, scones and a big pot of tea served with fine bone china cups, saucers and plates. The food is usually served on a three tier stand. Though this tradition dates back to the 19th century it is as popular today. A modern version in our City even combines spa treatments. Below are our favourite places. 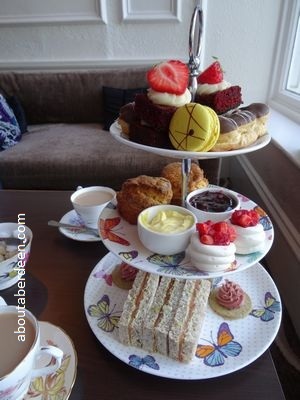 Pictured above is the afternoon tea at The Caledonian by Thistle Hotel Aberdeen located on Union Terrace. This beautiful four star Victorian Hotel is the ideal place to enjoy this treat. It is served in their Terrace Lounge which gives some great views across the City, including the magnificent spire of the Triple Kirk and Union Terrace Gardens as guests enjoy soft background jazz music. We indulged in the Caledonian Hotel Afternoon Tea £13-95 per person package, though guests can have theirs served with Prosecco or a cocktail for £20.45 each or with Champagne for £22.95pp. We had the choice of leave tea ranging from English breakfast, Earl Grey, Assan, Lapsang Souchong or Darjeeling. We have deliberately placed them at the top of this review page because we consider it the finest served in the City. All the treats are homemade in the kitchen by their talented chefs. There is a wide choice of finger sandwiches and we can thoroughly recommend the smoked salmon with cream pea pesto filling and the prawn and citrus mayonnaise filling. Other equally delicious fillings include mature cheddar and spiced tomato chutney, lightly spiced chicken with cucumber riata or smoked pastrami with horseradish. These were served with oatcakes with chicken liver pate which sets the Scottish theme which continues with the other fresh and seasonal ingredients. The setting is so relaxing, especially the large comfy armchairs by the window. In addition to the fine bone china crockery there are white linen napkins and finest cutlery which aids to the feeling of opulence and relaxation. The three tiered cake stand is so pretty and in itself is a visual treat that really deserves being piped in as it is presented by the efficient and polite staff. Special mention must go to the homemade apricot scones which are served warmed with homemade strawberry jam and clotted cream. Their unique fruity taste sets the level for the rest of the eating which surpasses other establishments in terms of quality and quantity. There was so much served that we didn�t have anything else to eat later in the day. The seasonal cakes are also made on the premises and included fruit intensive mini pavlovas, deeply beetroot coloured velvet cake topped with fresh strawberries, pink and yellow macaroons which continue the fruit theme and tasted smoothly of lemon and raspberry and melted in the mouth. Even the mini chocolate eclairs had a clever citrus cream filling. Whenever we are in the city centre we like to head to the Carmelite Hotel on Stirling Street in the Merchant Quarter. Carmelite Hotel can be found between Union Street and Union Square Shopping Centre. The Carmelite afternoon tea is served on a three tier cake stand with a pot of tea or coffee. We were treated to free refills of hot drinks at no extra charge. The sandwiches were lovely and thick with fresh bread and our favourite fillings are roast ham with red onion chutney and smoked salmon with and creme fraiche. Cakes included a light fruit cake and battenburg cake. There were generous helpings of butter, jam and clotted cream for their tasty scones. Fresh strawberries are added to each tier. The price was just £18 for two. It can be upgraded to include cocktails served in a china teapot or champagne. An example of a cocktail at Carmelite is their Cosmopolitan Gin which contains Beefeater gin, triple sec, lime juice and orange bitters, with cranberry juice.  Timings at the Carmelite Hotel is from noon until 6pm each day. It is advisable to book for weekend visits since this Hotel is very popular. Those with a love for historic buildings will enjoy the setting in this traditional granite building with atmospheric wooden flooring and d�cor with views across the cobbled street. The service was polite and punctual without being rushed in a nice quiet setting. For a quick treat visit Marks and Spencer in Union Square Shopping Centre. We often pop here in-between films at Cineworld or for a break between shopping. The M&S afternoon tea is served between 2 and 6pm in their upstairs caf� with views across to the harbour. 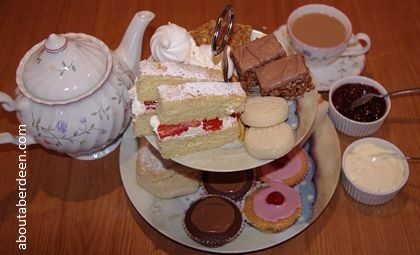 This is a cheaper option of Aberdeen afternoon tea and whilst you still get the standard expected of Marks and Spencer there are no frills like lace doilies or tiered cake stand. But the price is an incredible £10 for two. The sandwiches are cut into finger sandwiches with delicious fillings such as free range egg and watercress, Scottish Lochmuir oak-smoked salmon and cream cheese and British rare roast beef and horseradish. The real treat are the scones. A choice of fruit and plain scone and these are the lightest and tastiest we have had in the city. 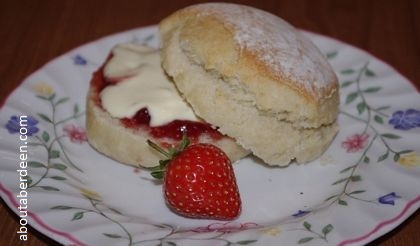 They are served with butter, jam and fresh clotted cream. A pot of tea for two is included in the price along with a cake from their wide selection. For another treat try the Falls of Feugh Tea Rooms in Banchory. It can be found just to the left turn across the bridge at the Falls of Feugh and by the free car park. There is separate car parking at the tea rooms and disabled access. The charm of this Aberdeenshire afternoon tea is the stunning views of the River Dee that can be enjoyed as you eat. A warm welcome awaits visitors into this tastefully decorated cottage with conservatory extensions. The central fireplace in the main room is a stunning feature and paintings of strawberries adorn the walls. This strawberry theme continues with the strawberry decorated fine bone china cups, saucers, teapot and plates. Generous helpings of freshly made sandwiches, fresh strawberries, cakes and shortbread are served on a platter. Nice chunky ham with onion relish and egg with cress sandwiches were enjoyed. The scones were freshly made that morning by their chef. They were wonderfully light and crumbled in the mouth. These were served with homemade strawberry jam with bits of fruit in them, much more enjoyable than smooth jam, and clotted cream. 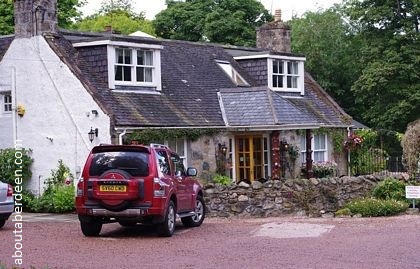 The cakes served at the Falls of Feugh Tea Room are also baked in the kitchens of this family run restaurant. 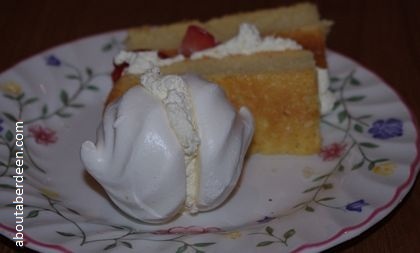 Special mention goes to the light but crunchy meringue that melts in the mouth with a warming sugary aftertaste. We also enjoyed chocolate crispy cake with dates, a refreshing and filling strawberry sponge cake and homemade shortbread biscuits. This was washed down with several cups from their large strawberry teapot. On fine weather days meals can be taken on the balcony and below are photos of the view down the River Dee. 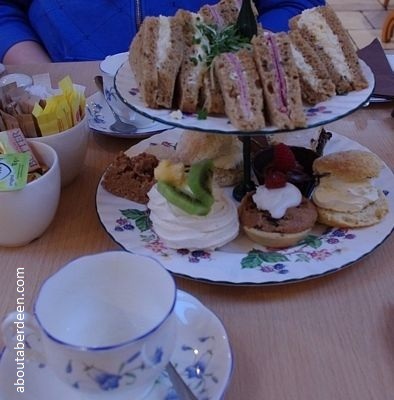 The cost of afternoon tea at the Falls of Feugh Tea Room Banchory was £12.95 with the option of paying more for a champagne afternoon tea for special occasions. Bookings are advisable and it starts from 2:30pm. Visit www.thefallsoffeugh.com to book or for more information such as opening hours. Visit our Falls of Feugh page for photos of the area, the history and the salmon jumping. More Things To Do In Aberdeen.